Origin and Habitat: New Mexico, Arizona, USA and Sonora, Chihuahua, Mexico. 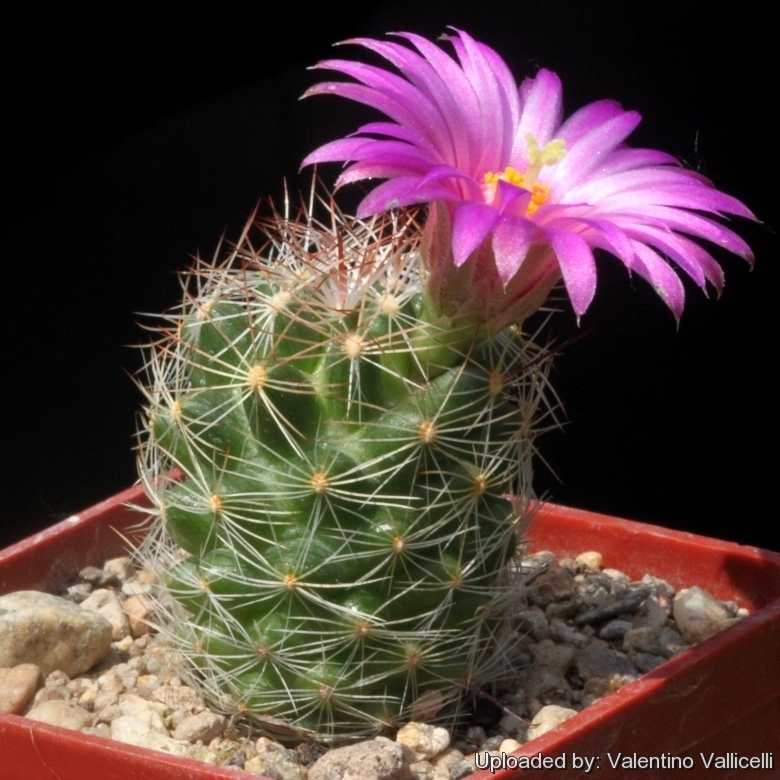 Habitat: It grows in a arid environment with hot summers and cold winters (often snow-covered) in association with other succulents like Mammillaria grahamii and Coryphantha aggregata. Ebnerella wilcoxii (Toumey ex K.Schum.) Buxb. Mammillaria wilcoxii Toumey ex K.Schum. Mammillaria wrightii var. wolfii (D.R.Hunt) Repp. Mammillaria meridiorosei Castetter, P.Pierce & K.H.Schwer. Description: Mammillaria wilcoxii is a solitary plant without a large underground base, often regarded as a western form of Mammillaria wrightii. Stem: Depressed, rounded, nearly spherical to short-cylindrical, flabby in texture, green to dull-green, up to 12 cm in diameter, but often much smaller about 5-6 cm in diameter. Without latex. Tubercles: Cylindrical to conical slightly flattened 5-20 mm long, bases about 5 mm wide. Areoles: Like in the other Mammillaria the areoles are dimorphic, with a circular to oval spinous part with short wool on the tip of the tubercles and the floral portion in the axil. Radial spine: 14 - 16(-22), thin, bristle-like, slender and straight, white with slighter brown tips or occasianally the wole spine light brown, to 8-15 mm long, widely spreading outward and interlocking. Central spine: Usually only 1, but sometime up to 5, of which 1 to 3 hooked, 2 cm long, stronger than the radials, brown, paler below. Under a lens the spines shows a fine down-like pubescence. Flowering period in Cultivation (Europe): May-june. 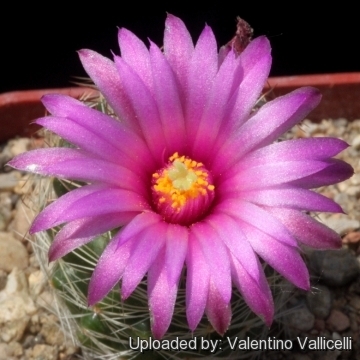 Mammillaria meridiorosei Castetter, P.Pierce & K.H.Schwer. : This is one of the large-flowered Mammillarias. Blooms are pink to purple or fuchsia red. 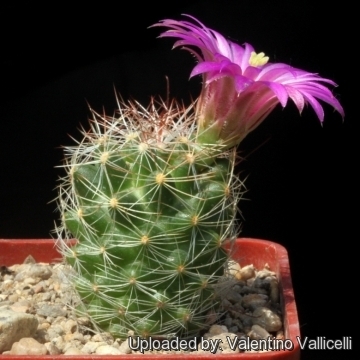 It is quite similar if not the same as Mammillaria wrightii var. wilcoxii. Mammillaria wrightii subs. wilcoxii (Toumey ex K.Schum.) D.R.Hunt: Similar to species except for the greater number of radial spines (14 to 22). Blooms are are vivid purple or, occasionally, white. Distribution. Southeastern Arizona, extreme southwestern New Mexico, Chihuahua and Sonora. Mammillaria wrightii var. wolfii (D.R.Hunt) Repp. : It is distinguished for its large white flowers, up to 6 cm in diameter. Notes: The showy flowers of Mammillaria wilcoxii are virtually identical to those of Coryphantha macromeris and Escobaria vivipara; in the absence of vegetative material, flowers may be unidentifiable. Cultivation and Propagation: Mammillaria wrightii var. wilcoxii is a single stemmed species that comes from an area of summer rainfall. It is quite cold resistant, but the frost resistance varies a lot from clone to clone. It can easily be grown outdoors in areas with minimum winter temperatures of -15° C. It needs full sun to light shade. Traditional uses: The white, hooked spines of this spherical cactus were used as fish hooks in its native Mexico.